In its 20th year, the Pilaros Taste of the Danforth has been a signature event each summer. Showcasing the best of Hellenic food, culture, and music our multicultural city has to offer – from souvlaki to mezes, authentic Greek music to interactive children’s games! Come enjoy the culture that makes the Danforth a year round destination. 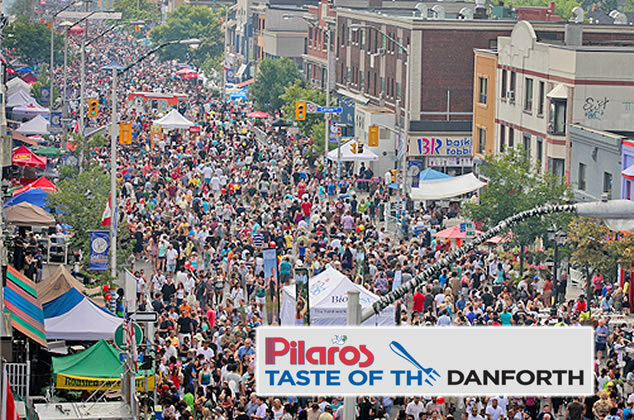 This year, the Pilaros Taste of the Danforth is aiming to go BIG or go home – literally! We have been pre-qualified, by Guinness World Records, to break the world’s record for the largest Greek Yogourt Bowl. The Pilaros Taste of the Danforth, in conjunction with Astro Yogourt, will be building a five foot tall yogourt container, holding over 1,300 pounds of yogourt. The previous world record was set in 2010, by Fair Cape Dairies in South Africa, with a height of 4.52 feet and contained only 1,100 pounds of Rooibos yogurt. Join us at 12pm to witness us fill up the World’s Largest Yogourt bowl! Continuing with our “go BIG or go home” promise, the Pilaros Taste of the Danforth is inviting everyone to join us in breaking the world record for the Longest Zorba Dance ever. Spanning over two kilometres of the Danforth, we are inviting 10,000 of our friends to join us in our record-breaking attempt. The previous world record was set in the City of Volos, Greece in 2012, with 5,164 dancers. Be a record breaker and join us on Saturday August 10th at 1:30pm! Skating in August on the Danforth? – With a surprise NHL star! Yes, you can skate on the Danforth in the middle of August at this year’s Festival (we would tell you how but we have been sworn to absolute secrecy – come find out how!). Bring a helmet – we’ll provide the skates. You might even bump into one of your favourite heroes from the Maple Leafs. “My Big Fat Greek Wedding” – Win the honeymoon of your dreams to Greece and the Caribbean. Come two, come all! The Pilaros Taste of the Danforth will be hosting an exciting “My Big Fat Greek Wedding” competition where lovebirds will send in entries of their romantic proposals. Two winning couples will be sent on the honeymoon of their dreams. Finalists can win either a cruise to Greece from Transat Holidays, a resort honeymoon in St. Lucia, or a stunning 1.3 carat diamond earrings and pendant set from Canadian Rocks (approximate value $4,800). Just who will become the Best Couple of the Year? The world awaits. Metroland will be handing out our Festival brochures in our estival information booths. The brochures will contain a map of all of the activities, as well as the schedules for all of our three Stages. It will also contain a secret passcode from Loblaws Maple Leaf Gardens, which will allow entry into another exciting contest where trips can be won to either Greece, compliments of Transat Holidays, or the Caribbean, compliments of the Saint Lucia Tourism Board.